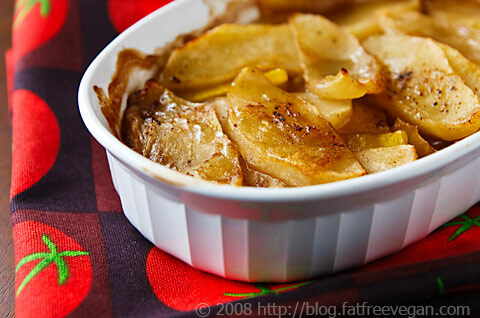 In this crustless apple-pumpkin pie, slices of fresh pumpkin and apples equal a fantastic low-fat delight. Bonus sugar-free version is also included. What if you love pie but don’t like crust? Strange as it sounds to me, I have a daughter who doesn’t like crust–on bread, on pizza, or on pie. Her aversion is not a big deal because she can always eat around it, but since I have my own reasons for avoiding pie crust, I like to make desserts that taste like pie but don’t have a crust…at least not a traditional crust. 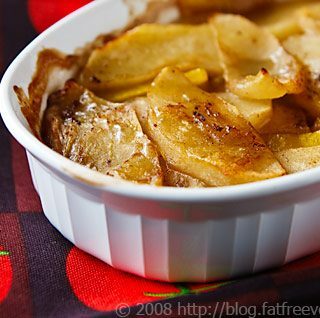 So here’s a dessert that makes use of the apples and winter squash that are in season now and tastes like a crustless apple pie. 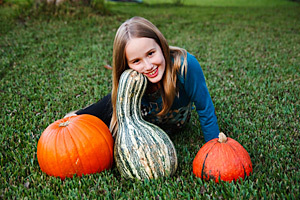 The pumpkin she’s snuggling up to is the one I used for this recipe. Actually, it’s a 10+ pound cushaw, rather than a pumpkin, and though it’s milder and sweeter in taste, the main difference between it and your traditional orange pumpkin is that it is much easier to peel because it’s smooth rather than ridged. You probably won’t be able to find cushaws outside of the South, but if you do, be sure to grab one, or if you’re into gardening, think about buying some cushaw seeds online and growing some in your area. It’s a shame that they’re available almost exclusively in roadside stands and private gardens in the South. Since this cushaw was so huge, I used only half of the neck section for this dessert. I have a feeling I’m in for a pumpkin butter-making session later this week. Don’t tell my extended family, but they will probably be getting jars of homemade pumpkin butter for Christmas. After cutting off the “neck,” I halved it, stood the halves upright, and peeled them with a sharp chef’s knife. The skin is very tough, so it’s much easier to peel with a knife than with a peeler. I then cut the halves in half and sliced the squash very thinly. 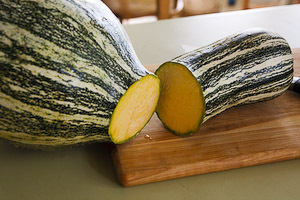 No matter what kind of squash you use, you’ll find that the thinner you cut it, the better. …it reduces as it cooks, so it doesn’t overflow the dish. It will leave your dish looking pretty messy, though, so plan to transfer it to some nice dessert dishes before serving. Peel the pumpkin or squash and slice it thinly into pieces about 1-inch square (the size matters less than the thinness). Peel the apples and cut into slices, a little thicker than the pumpkin. Preheat oven to 400F. Mix together the sugar, cinnamon, nutmeg, cloves, and cornstarch. Oil a 2-quart casserole dish. 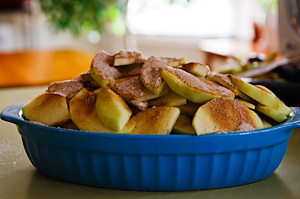 Arrange half of the pumpkin slices in the dish, and sprinkle with about 1/4 of the sugar mixture; arrange half of the apple slices over the pumpkin and sprinkle with a quarter of the sugar mixture. Repeat pumpkin and sugar and arrange the final layer of apples on top, heaping slightly in the center if necessary; sprinkle with remaining sugar mixture. Cover with foil and bake for 40 minutes. Remove foil and bake for about another 15 minutes. Use a knife to lift up some of the apples and check to see that the pumpkin slices in the middle are completely done; if not, return to the oven until pumpkin is tender. Serve warm or cold. Stop the presses! Just a few minutes ago I made another one of these, a 2-serving size without sugar. Honestly, I was prepared for it to be not that good, but it came out surprisingly delicious. I used KAL-brand stevia for sweetening, but it should work with any sweetener that can be cooked. It is a little dry on top, however, so if you’re not averse to a little sugar, try drizzling some agave nectar over the top after cooking. For this sugar-free treat, I used KAL-brand stevia for sweetening, but it should work with any sweetener that can be cooked. It is a little dry on top, however, so if you’re not averse to a little sugar, try drizzling some agave nectar over the top after cooking. Peel the pumpkin or squash and slice it thinly into pieces about 1-inch square (the size matters less than the thinness). Peel the apple and cut into slices, a little thicker than the pumpkin. Oil a small casserole dish. 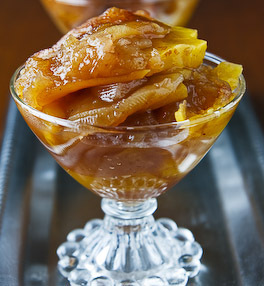 Arrange half of the pumpkin slices in the dish, and arrange half of the apple slices over the pumpkin. Repeat layers, heaping slightly in the center if necessary. Pour the apple juice mixture over all. I try to follow the old adage "an apple a day keeps the doctor away," but in the winter a cold apple isn't always what I feel like eating as my morning snack. The second version of this recipe is great because it's got almost no added sugars -I just used a teaspoon of agave- and it can be eaten warm. Thanks for keeping me away from less healthy cold weather snacks. Thanks for the ingredients list. I have made less and less baked apples due to me not wanting to drizzle or drench it in sugar and butter. What a great alternative – just leave it out. I love also you mix squash and apples. That makes the eating fun and less noticeable. This looks wonderful! I’ve been looking for a sugarfree vegan dessert for Thanksgiving this year, since we’ve tossed out all traces of sugar in our house and don’t intend to buy another granule ever again. Thanks, Susan! Man, your food looks good! Why have I not favorited this website before? All these recipes look amazing and don’t require ridiculously exotic or expensive ingredients. 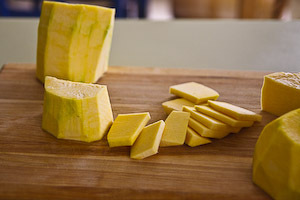 Will be trying the first version of this when I get my hands on some butternut squash! I cannot tell you what a success this recipe was! I’ve made many of your other delicious desserts to great acclaim, but this simple recipe I assumed would just be an easy weeknight dessert – but it was SO good! I had it for breakfast the next morning and it was just as delicious, too (apples and pumpkin are healthy, right?). I substituted 2 T brown sugar and 3/4 cup measures-for-sugar stevia for the sugar with no problems. I will be making this again and again! I cannot BELIEVE how easy and delicious and autumnal this combination is! Thanks again for this and the rest of your fabulous blog! Why does this have to look sooo good. 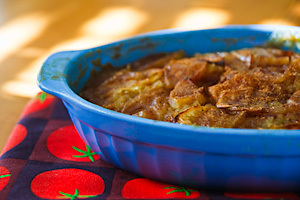 If you don’t like the taste of stevia (as my husband doesn’t like it at all) I have been making almost everything with either pear sauce or applesauce for the sweetness. It works for the sweetness in most baking, you may need to adjust the liquid, but in pies, cakes and even cookies it works like a charm. I just made a pumpkin pie with 1/2 of the sugar and added coconut milk instead of the regular dairy and it was excellent. I will try to eliminate the sugar next time with some pear sauce. I’ll let you know…. Love your site! Has anyone tried this with Butternut Squash yet? Is it sweet enough? 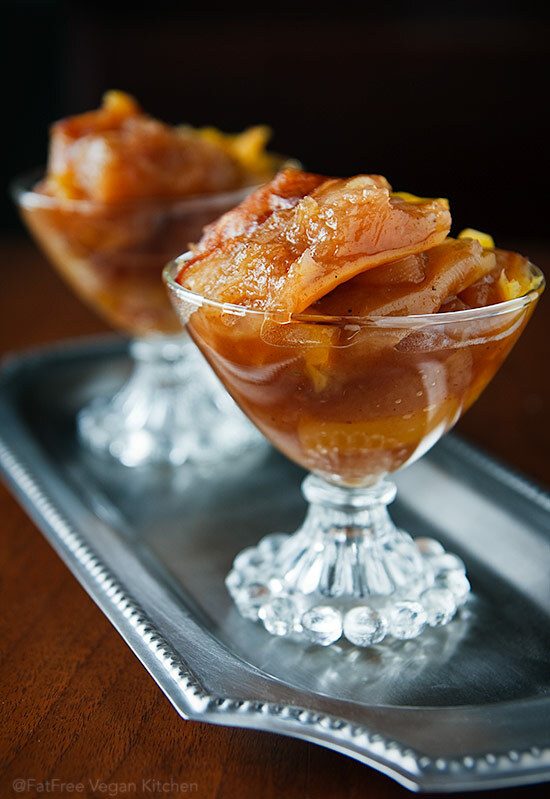 I have an abundance and would love to make something like this as my Thanksgiving dessert. Butternut should work fine. Hope you enjoy it! This looks amazing and I’m excited to give it a try soon. I love baking but it’s really nice to find healthier treats that you can enjoy without oats or flour bulking them up. Yummy!